Halloween is not my favorite holiday. I don’t like scary things, blood, gore, or any of the other creepy, evil characters and costumes. They scare me:) In the past, we have celebrated many different ways, mostly running or attending harvest parties. This year, the big girls had parties through their youth groups, but Rob and I did not participate. We did, however, manage to have some fun with it this year, because it’s always fun to be with the kids. When your life changes, you either change with it, or sit at home and sulk. I prefer to have fun! 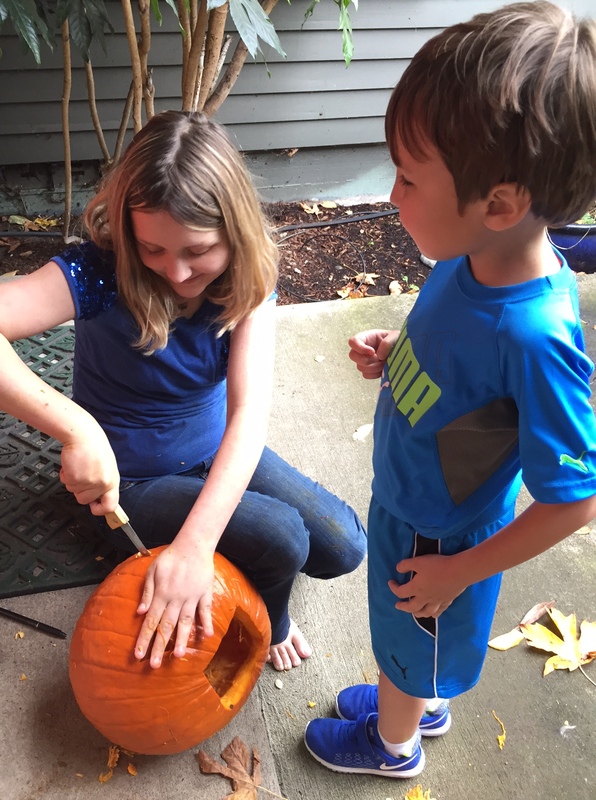 Alissa and Jake carved a pumpkin. It is pictured above. I stayed far, far away from that scary knife:) Lovana supervised Patsy’s carving and hers came out really well, too. Rob came over to my sister’s house right after work to help out with the festivities. Most of the kids dressed up. Ja’Ana decided not to, but willingly helped Jake be safe as he went up and down the street. Rob followed in the van with Michaela riding shotgun, eating the Reese’s Peanut Butter Cups and Tootsie Roll candies he bought her. She never left the van, but had a marvelous time. Afterwards, she came home and went straight to bed, probably in a blissful sugar haze. 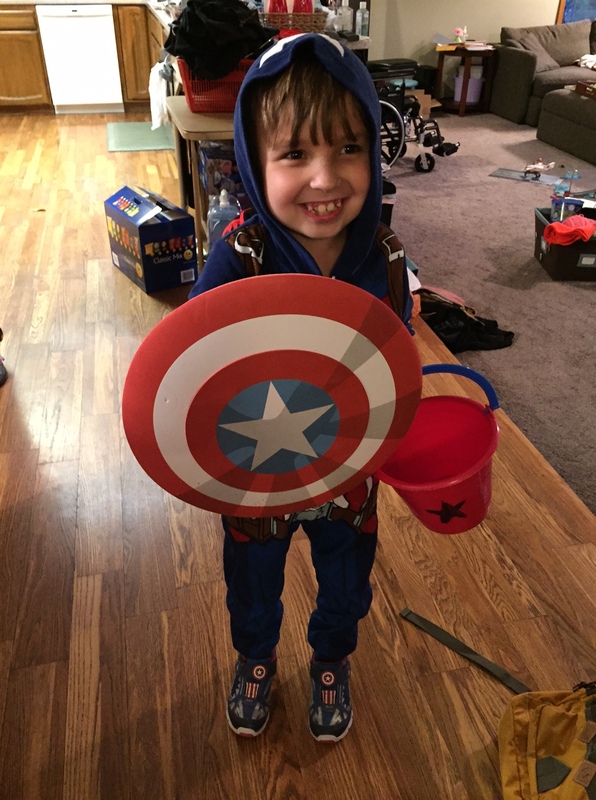 Captain America was ready for his excursion! After Alissa, Jake and Michaela’s daddy got them ready, including putting Alissa’s wig straight, finding all the lost parts and pieces for Jake’s costume, etc., he ran off to teach his Monday night Bible study class, which was meeting as usual. My sister did not get home from work until after 8, a super busy day for her. I stayed at the house with Lovana and the dog, handing out candy to all the little kids who came knocking at the door. After a while, most of our kids got tired and Rob came back to the house with them, where Jake and Patsy handed out more candy. It was an exhausting, fun, candy-filled night for everyone and we enjoyed ourselves immensely. I am not a Halloween fan either, but I do love seeing kids like these dressed up for fun. It just seems the holiday has changed so much and I can no longer enjoy it. 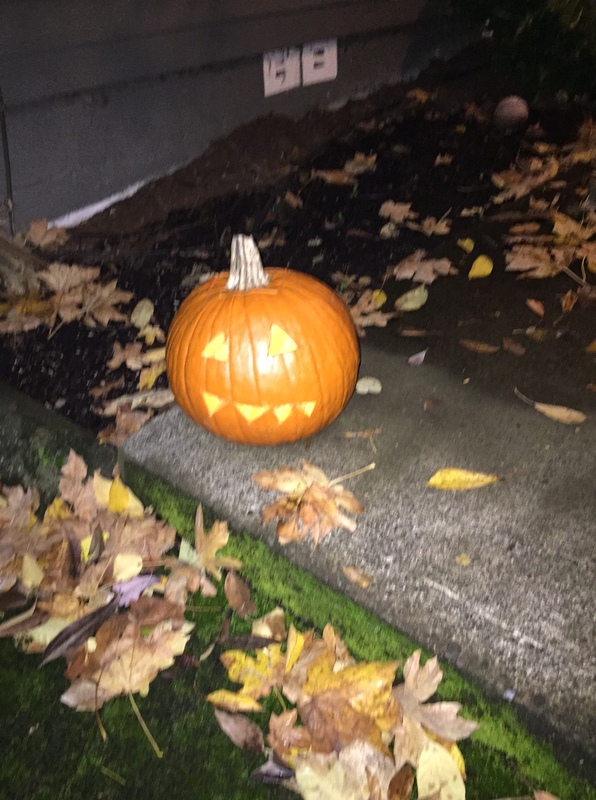 Where we live, we get no trick-or-treaters, and my daughter at home was so exhausted from all her band travel lately that she didn’t want to do anything, so it was just another day to us. 🙂 Well, I did buy both daughters some candy, because that’s the part of the holiday I CAN get into! Ha! There was so much candy flowing around–still is today. I love candy way too much, as well. I’m glad you had a restful evening. I could certainly use one of those soon. The kids were all very tired today, but all made it through. We were surprised at how much candy Michaela ate–Rob got a whole bag of Reese’s for her and a lot of it was gone. That’s all she wanted–that and Tootsie Rolls–she didn’t care about anything but that and wearing the “big cat” pajamas her mama got for her. So, I don’t blame you daughter for wanting to eat candy and rest. Lovana just rested, too. Hi! It’s me again. In the midst of our move I remember reading of your move and it was very helpful for me going through this after you! And I can see there is an end…you did successfully move and settle in your new home and I love how you painted and restored the hardwoods floors. I’m so glad you are almost moved! That is the worst–packing, being unsettled. I know you’ll be delighted to get settled again. You had way more traffic than I did at my sister’s house. 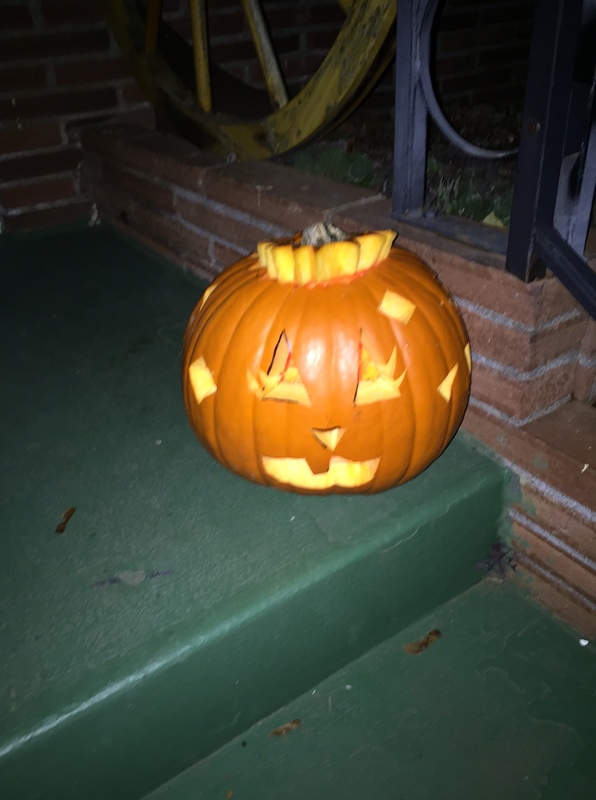 Where I was giving out candy, there was just a nice steady flow–the most at once was about 7 and that was very rare–there were also lots of gaps where no one came. So, not bad. 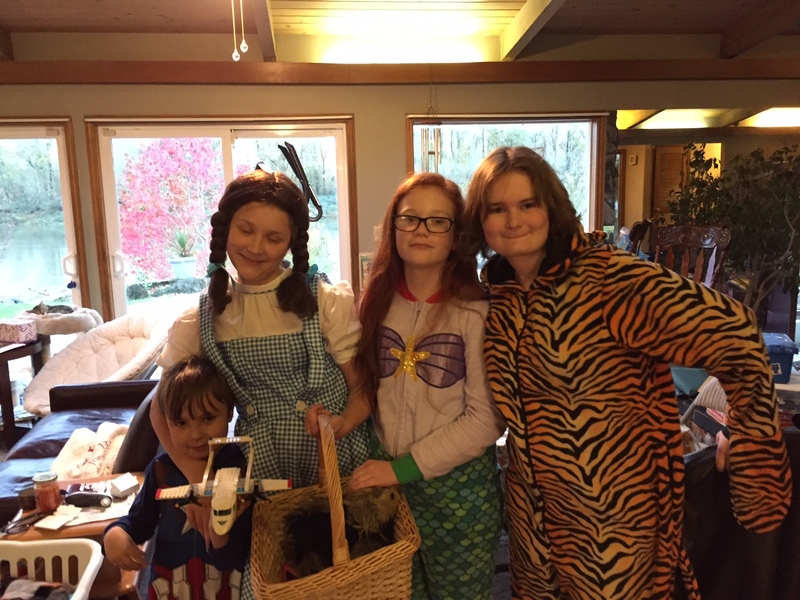 And, they bought all the candy and there was lots left, so we all munched some down–fun!